There is a $50.00 Annual Affiliate and/or Distributor Fee which gives you access to the Distributor Center, Distributor Replicated Website, as well as a Debit Master Card for a commissions account. As a Rezealiant Living Distributor, a monthly purchase starting at 40 PV (up to 300 PV at higher ranks) qualifies you to participate in our generous Financial Freedom Plan, where you have the potential to earn up to 9 levels of commissions and bonuses as you build your organization. 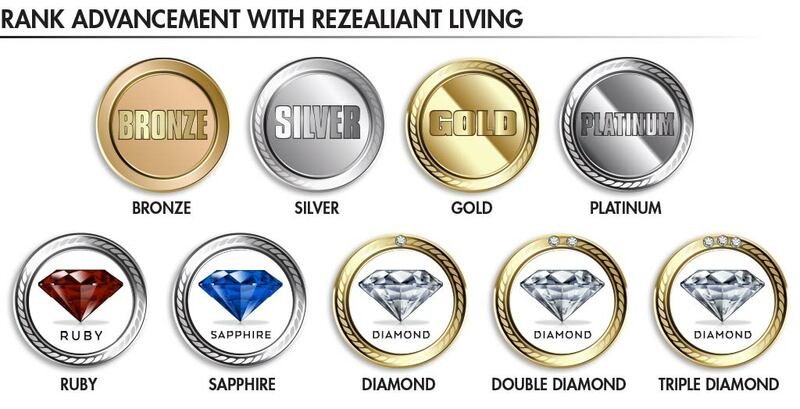 The Rezealiant Financial Freedom Plan uses Dynamic Compression and Infinity Bonuses to guarantee that all 9 levels of commissionable volume are compressed and paid to our qualified distributors, as well as, paying out additional bonuses earned. To qualify for the first rank, the eligibility requirement to earn a monthly commission is a minimum of 40 PV in the commission month. To qualify for ranks 2 and above, the eligibility requirement to earn a monthly commission is a minimum of 60 PV up to 300 PV in the commission month. There is a monthly AUTOSHIP requirement for all ranks to earn commissions. There are other qualifying rank requirements to move up in rank. Commissions are paid weekly on the qualifying volume of the products purchased in your downline organization. Placement Changes are allowed within the first 30 days of membership; Company approval and a Placement Change form is required. Standard and Dynamic compression applies to all levels. Downline: All of the Distributors below you. GV (Group Volume): The total volume of products purchased from your downline during a commission period. Leg: The downline of any of your first level Affiliates/Distributors. PV (Personal Volume):The commissionable amount of your personal product purchase. Rank: For example: Affiliate, Bronze, Silver, etc. Standard Compression: Removes levels with no volume purchases and compresses up, replacing them with the next downline active volume. For example, if someone on your 3rd level makes a purchase, but your levels 1 & 2 do not, the level 3 PV is compressed up, and is regarded as your 1st level for that commission period. Infinity (Dynamic Compression): Dynamically compresses any volume up that has not been paid out through rank and enables the company to pay through all 9 levels. If a Distributor is not qualified to receive a commission, the commission will be paid to the next upline qualified Distributor.